You might be very aware of the important family heirlooms that your parent’s own. Often, a parent officially declares which items should go to what family member after the parent’s pass on. That information might be in a will. This leaves a tougher problem unanswered: What to do with your parents stuff. Times change. Your parents may have picked out a formal china pattern shortly after getting married. They might have been given chafing dishes or fondue pots as wedding presents. Over the years, your parents may have bought a heavy mahogany dining table and matching chairs, and wooden end tables for the living room. Your tastes are likely to be very different from that of your parents. As such, you may not feel the need to hang onto all of your parent’s stuff after they die. Don’t feel guilty. Your own children might not want to keep everything you once owned, either. No one has the space for all of their stuff and all of their parent’s stuff. Keep the heirlooms – A item that has been handed down for generations is probably worth hanging on to. People often keep old photo albums, slides, and VHS tapes of family events. Someone in your family might want your parent’s wedding rings or the quilt that mom made by hand. Get the jewelry appraised – A jewelry appraiser can tell the difference between “junk jewelry” and the good stuff. They can also tell you the monetary value of each piece. This knowledge could guide you to try and sell particular pieces or to donate it all to Goodwill. Contact nearby shelters – You might not have a use for all the kitchen utensils, pots, pans, glasses and dishes in your parent’s kitchen. A local shelter might be in need of it! Make a list of every item and then start calling local shelters. Someone there can tell you what they are in need of and how to donate it. Shelters also tend to need extra blankets, coats, and clothing. Search online – There could be a market for the collectables that your parents owned. See if the artwork your parents purchased has financial value. Find the local library’s website and see if you can donate hard cover, trade paper, and paper back books to it. Call your relatives – There’s a chance that one or more of your relatives might want something that your parents owned. They may be looking for something small to remember them by. Someone might be moving into their first home and in need of furniture. 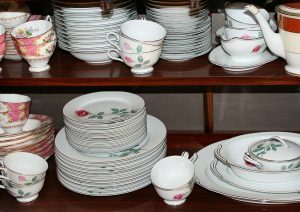 Take a good photo of specific items, send that photo to a relative, and ask if they would like to have it.